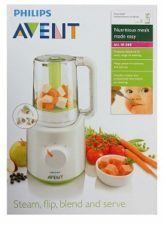 Beetroot will be in our menu at least once in two weeks for its healthy goodness. 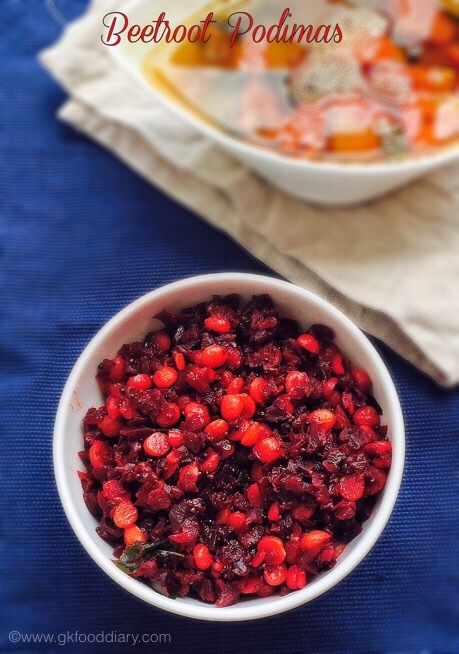 I usually make this simple beetroot stir fry. 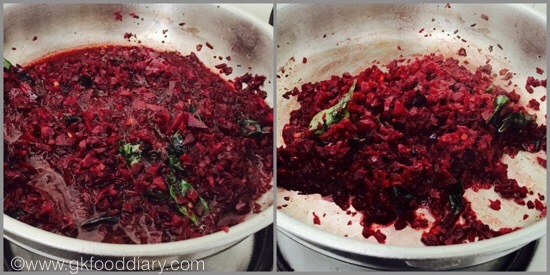 I thought I should try something different with beetroots and tried this easy beetroot stir fry. It tastes really good. 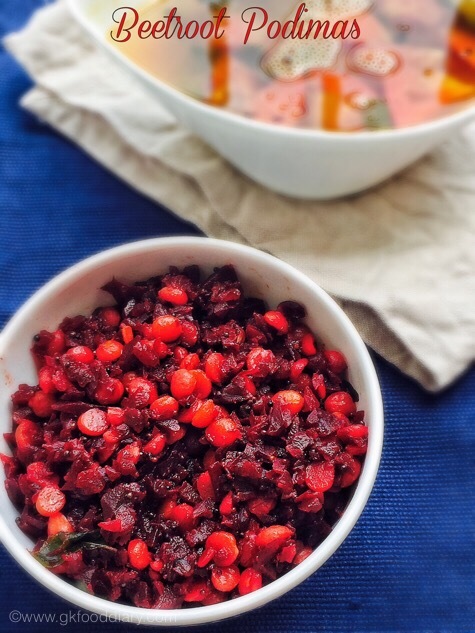 This beetroot podimas is very simple to make and more healthy with the addition of kadalai paruppu/Channa dal. 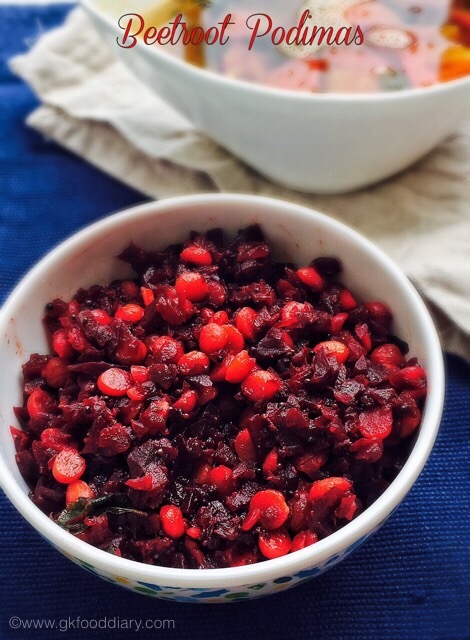 Let’s check how to make this easy beetroot poriyal. Wash the beetroot well in running water and grate them using a grater. Pressure cook the channa dal in a cup of water for 4 whistles. Open the cooker once pressure released. Set aside. Heat a pan with oil and add the items to temper. Once mustard cracks and urad dal turns brown, add curry leaves. Fry for a minute. 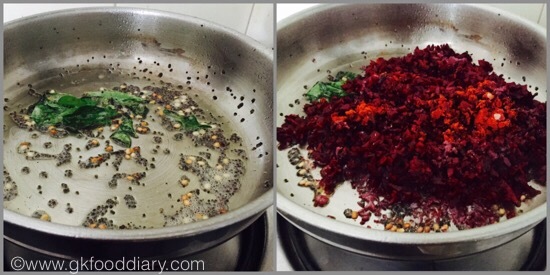 Then add grated beetroot along with red chilli powder and salt. Mix well. Add ¼ cup of water and cook covered in medium flame until the beetroot is cooked. This may take 7 to 10 minutes. Beetroot will be transparent once cooked. 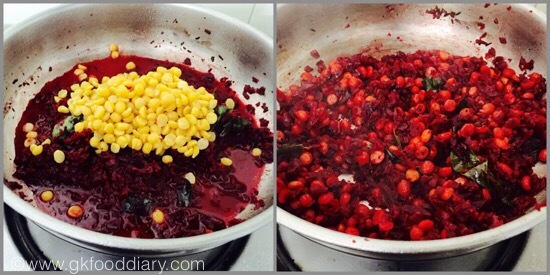 After the beetroot got cooked, add pressure cooked channa dal and mix well for 2 minutes. Turn the flame to high and evaporate the excess water if any. Once everything comes together, switch off the flame. 1. Wash the beetroot well in running water and grate them using a grater. Pressure cook the channa dal in a cup of water for 4 whistles. Open the cooker once pressure released. Set aside. 1. Heat a pan with oil and add the items to temper. 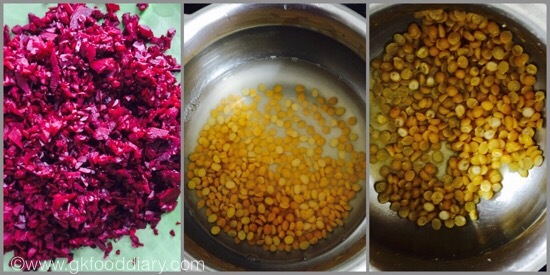 Once mustard cracks and urad dal turns brown, add curry leaves. Fry for a minute. Then add grated beetroot along with red chilli powder and salt. Mix well. 2. Add 1/4 cup of water and cook covered in medium flame until the beetroot is cooked. This may take 7 to 10 minutes. Beetroot will be transparent once cooked. 3. 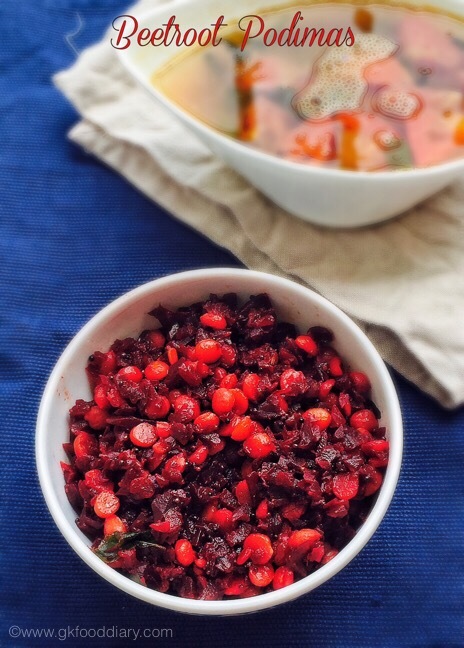 After the beetroot got cooked, add pressure cooked channa dal and mix well for 2 minutes. Turn the flame to high and evaporate the excess water if any. Once everything comes together, switch off the flame. The filling beetroot podimas is ready! Serve with hot steamed rice & any Kuzhambu of your choice. We had it with paruppu rasam. Instead of grating the beetroot, you can chop them to tiny cubes. You can add 1 tbsp of coconut at the end for extra flavor.